^ IN THE TRENCHES OF SCIENCE. 紐約時報. 1987-08-16. ^ Suspension Effect Astounds Scientists. 紐約時報. 1988-09-20. ^ Method for making superconductor films. 1991-12-13. 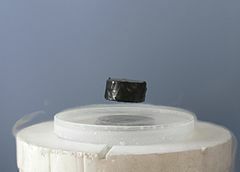 ^ Heating up of Superconductors. 物理評論快報. 2017. ^ 「超導體，我研究了一輩子！」專訪超導物理專家吳茂昆. 《研之有物》. 中央研究院. 2002-11-01.